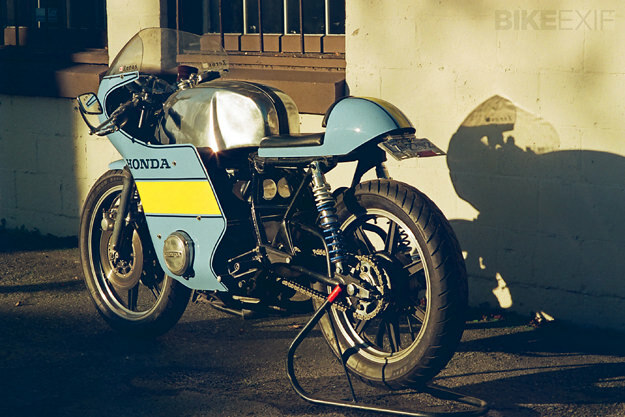 There’s a great story behind this Honda, owned by 33-year-old Chris Booth of Vancouver BC. Until he was 28, Chris swore that he’d never ride a motorcycle: “They’re far too dangerous.” Then he went on a road trip to Speed Week at Bonneville with three friends. 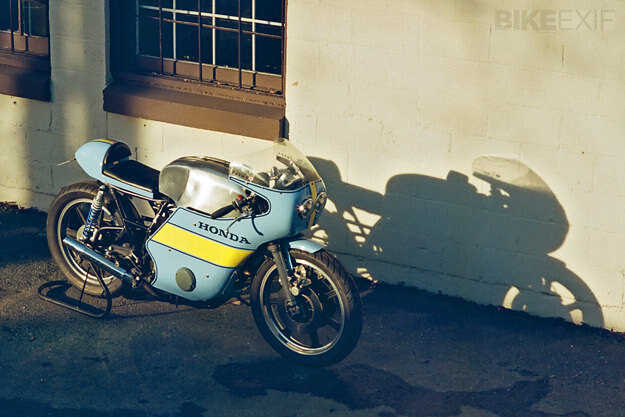 Chris had never thrown a leg over a bike before, but one of his friends had brought along a Honda CB cafe racer. And he let Chris ride it alongside the track—with no helmet, boots or gloves. After getting off the bike, Chris asked him how much he wanted for it. 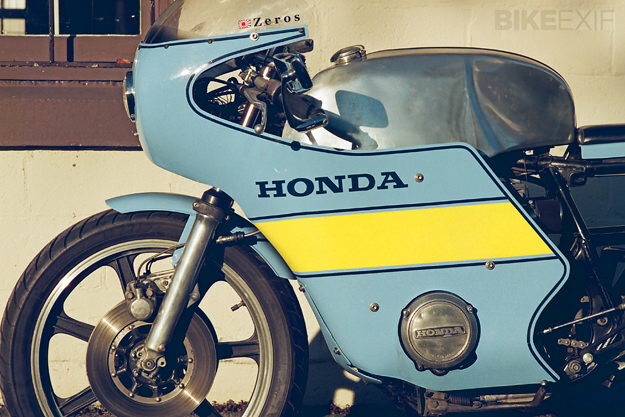 And so it began, with Chris scouring websites for photos and avidly reading sohc4.net, the online bible for owners of 1969-1982 Honda four cylinder motorcycles. The next winter, Chris upgraded the suspension with cartridge emulators and Works shocks. He fitted dual front discs and rear-sets, and installed fresh Avon rubber. 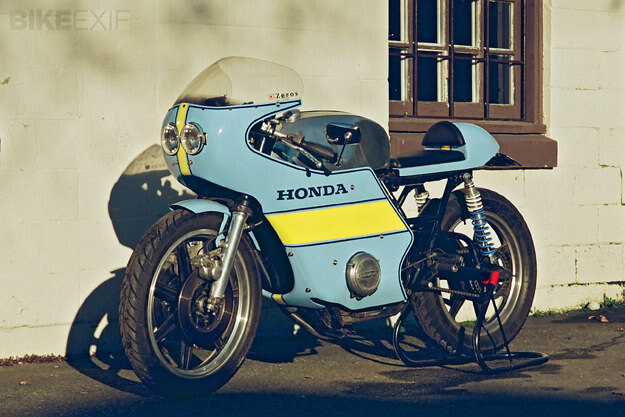 He also got his hands on a Rickman Commando alloy tank, and had it altered to suit the Honda. Then he threw in a 550 motor he picked up for a song. After six months, the 550 blew up. So Chris built up a new 550 motor, bored it out to 592cc with Dynoman 10.5:1 pistons, and ported and polished the head. 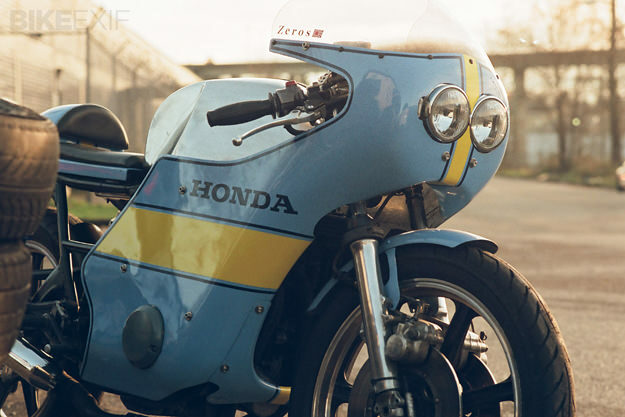 “At that point that I really got into vintage GP bikes. Nothing beats standing the bike up out of a corner and tucking into the fairing. I tracked down a guy in Holland who re-pops old MV Agusta 750ss fairings for the vintage race scene in Europe, and bought one.” It took 20 hours to fit it to the bike and manufacture the brackets. The paint scheme is inspired by the Yamaha ridden by Ago in his last World Championship, and the modern Rizla Suzuki MotoGP colors. 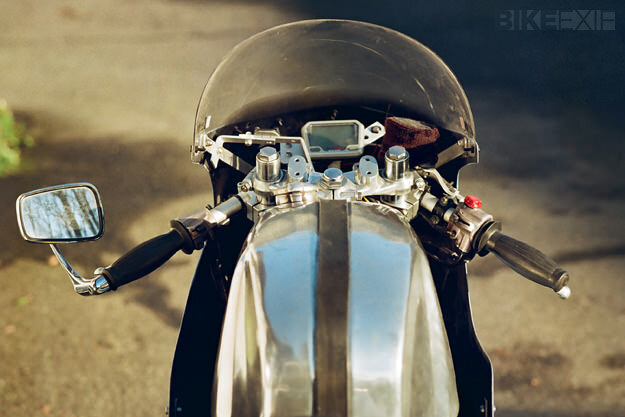 A cafe racer in the truest sense of the word. Thanks to photographer Luke Uri. Kodak Portra 160 film images taken with a Contax G1 w/ 90mm Zeiss and a Yashica FX-3 w/ 50mm Zeiss.